Los Planes de Renderos offers one of the nicest views of the south of the city of San Salvador. Los Planes (as everybody refers to the area) is one of the favorite hangouts for both foreigners and locals, especially during the weekend, because of its nice cool climate. Los Planes de Renderos is a place where lots of activities are held. It is very famous for the many "pupuserias" small diners that make pupusas, Salvadorian typical snack. 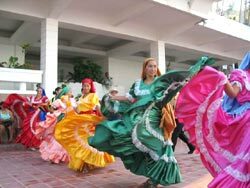 The "Casa de la Cultura", have artistic activities and expositions every now and then; as well as folk dances such as "Los Historiantes" which is a dance - drama. 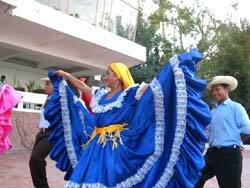 The most famous of these dances is called "Moros y Cristianos" and tells the story of Spaniards and Indigenous people during the conquest and colonization of America. During the presentation, every dancer wears big painted masks, and old coins hang from them. Some blindfold using handkerchiefs. Their costumes are made of silk and colorful colors. La Puerta del Diablo is located at approximately 6 km from the National Park Balboa in Los Planes de Renderos. La Puerta del Diablo is the highest point in San Salvador at 1250 m ASL. The place is a natural viewpoint of the east and west of El Salvador, from where you can see the volcano San Vicente or "Chinchontepeque" (which in Nahuatl means volcano of the two breasts), the Pacific Coast of the department of la Paz, Lake Ilopango, and the town of Panchimalco, etc. La Puerta del Diablo used to be one whole rock formation, officially called Cerro el Chulo, until 1700s when during the San Dionisio rain storm, broke down to three which are now: Chulo, Chulito (smallest one right at the center) and Chula. The name Puerta del Diablo (devil's doorway) can be traced to numerous stories, but the most popular one refers to a man making a pact with the devil in order to receive the approval of the family of the girl he wanted to marry. Once the pact was made, a big roar was heard, which caused the Cerro el Chulo to break.